Bamboo bedroom furniture is an excellent way to provide a unique look and an atmosphere of relaxation and peacefulness to bedrooms. A durable, light weight and environment friendly material such as bamboo adds a touch of comfort, along with plenty of style and texture to any room. Bedroom furniture made from bamboo is very easily moved around according to your mood so don't feel like you have to stick with one arrangement of furniture in your bedroom as you do with fixed bedroom designs. Some of the products available include beds, headboards, dressers, tables, ceiling fans, lighting, night stands, floor vases, linen boxes, floor screens, drawers, picture and bamboo mirror frames... the list is endless. You can finish off the interior design with blinds, curtains and drapes, bedding, sheets and duvet covers, and many other textile and bamboo products. Interior designers, DIY enthusiasts, and decorators find a range of uses for bamboo materials in contemporary décor and design, and at the same time recognise the many benefits of bamboo along with exceptional properties. The focal point to the bedroom will obviously be the actual bed. 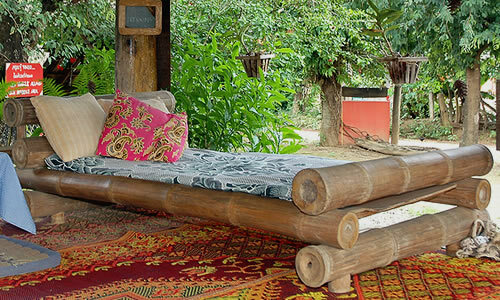 You can choose to have the whole bed constructed from bamboo or just a headboard to fix to another type of bed. There are different types of bamboo beds from the really chunky natural appearance, shown in the image below, to the more elegant designs with classical bedroom furniture. Bamboo is a lightweight but very strong material. Bamboo is a natural material and as such you treat it in the same way as you would similar products made from wood. You need to protect it from too much moisture or household dust. When you purchase your bed, enquire if the bed has already had any treatment and if it hasn't, ask for a recommendation on the appropriate treatment for the type of furniture.